I found this wonderful website last night…..with a very talented photographer….you can see her blog here….. http://www.morgantrinkerblog.com/ I was reading through her blog and she had some tips on how she brightened up her photographs….so I thought I would give it a try. Although I have had a little bit of experience through the craft website that I frequent….. www.jessicasprague.com and some of the classes there…it was fun to read through Morgan’s website…and look at all the lovely photos. I immediately thought of my daughter and niece who have their own photography business….and are just really starting out. Anyway…I took a photo I took at Christmas and opened it as a Camera Raw photo in Photoshop Bridge…and made a few adjustments and VOILA! I do like the edited image….the colors seem to pop better, the only thing I am not too happy with is the washed out part of my son’s hand in the foreground. I’m losing a little detail there. But overall..I like it much better! The yellow in the curtains and the red in the packages in the background is much better. The lampshade and the fireplace are whiter. This picture isn’t the best example…but if you peruse through Morgan’s website…she has some excellent examples of photo editing and Actions that she uses. Click to enlarge to better see the photos. This entry was posted on Friday, January 7th, 2011 at 12:49 pm and is filed under Uncategorized. You can follow any responses to this entry through the RSS 2.0 feed. You can leave a response, or trackback from your own site. 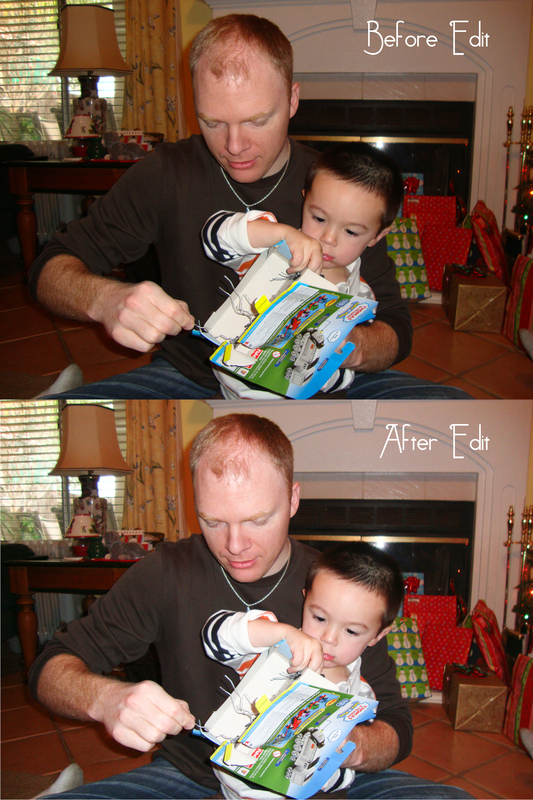 Joel’s teaching me a bunch of photo editing tips and tools in Photoshop… it’s kind of exciting to be able to make subtle changes to a picture that really enhance it, without making the people or items unrecognizable. Fun! !